Don’t ask a Villager if he or she is a Moses fan–the master planner wanted to turn Broome Street into a highway and extend vehicular traffic down Fifth Avenue, right through Washington Square Park, the perfect spot to start our tour. 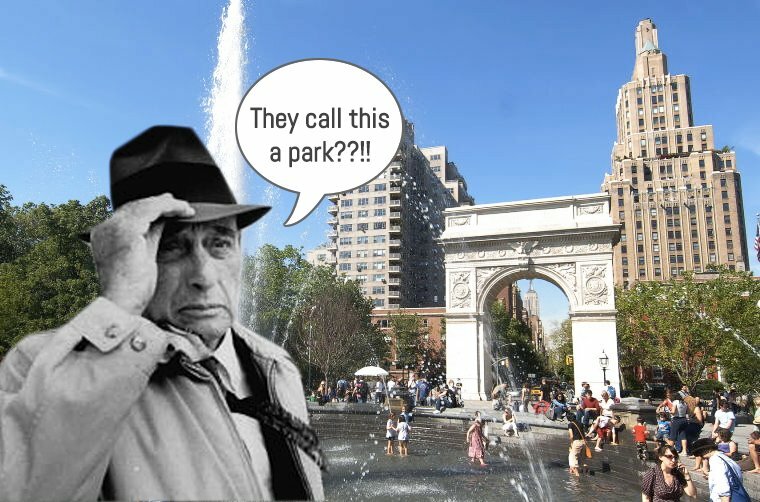 Wouldn’t it be fun to just sit on the fountain with Mr. Moses and take in all the sights, sounds, and hundreds of people having a lovely time in the well-preserved park. And maybe we’d time this for May of next year, during the Jane’s Walk weekend, since we know he was such an adoring fan of Jane Jacobs. 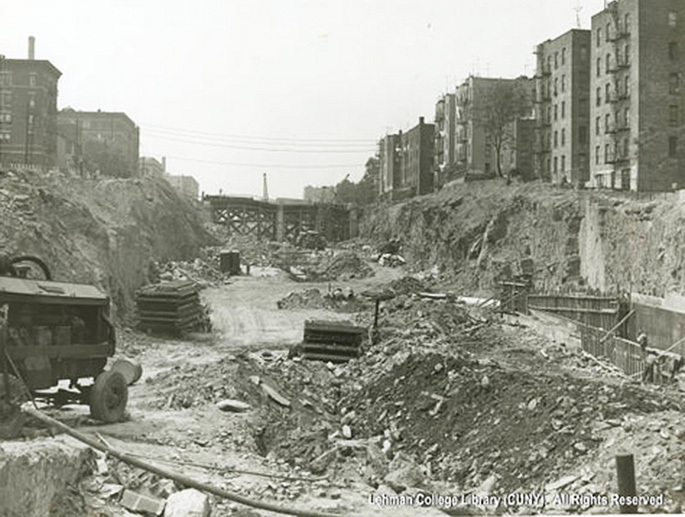 Next, we’d take a little stroll through the Lower East Side, where Moses’s famous slum clearance was prevalent, and up to 14th Street. 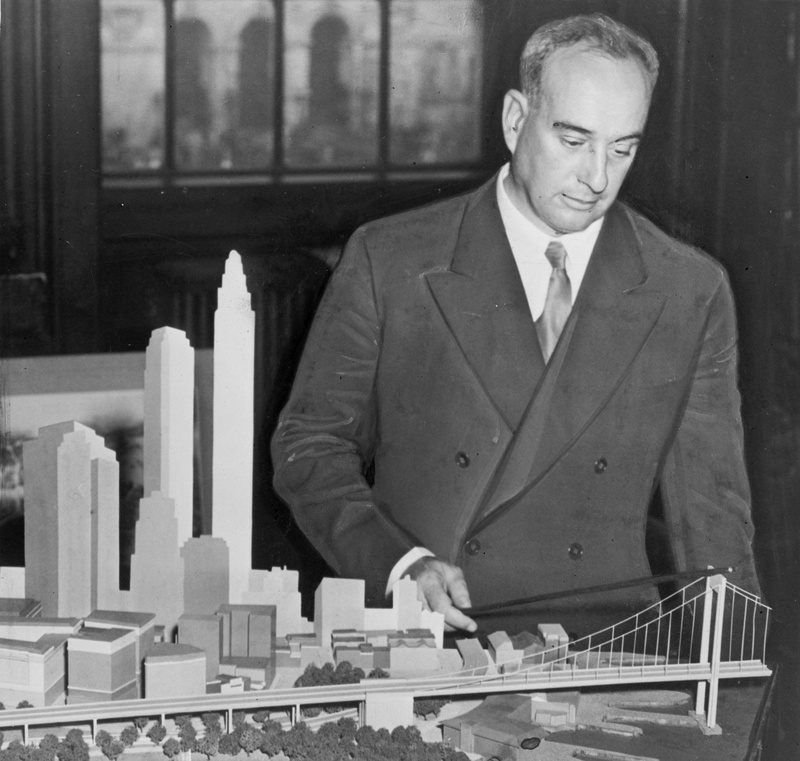 To “help” low-income neighborhoods, Robert Moses used eminent domain to raze them and erect tower-in-the-park-style apartment complexes, which we today know have proved woefully ineffective. 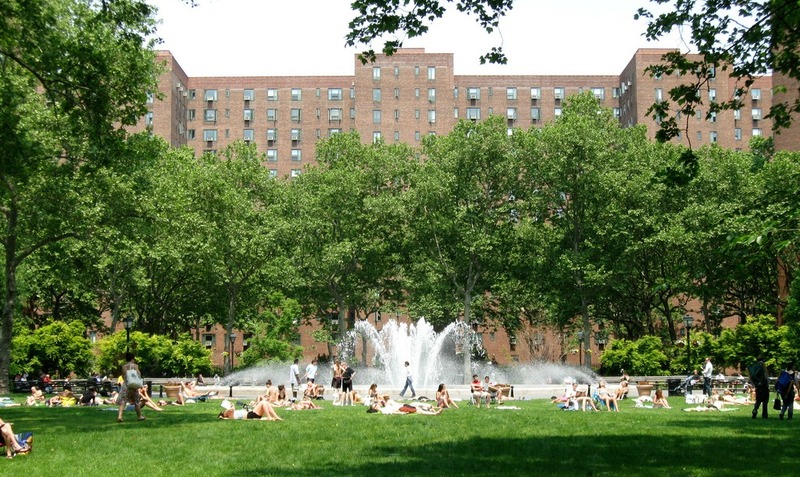 One of these projects started off with good intentions: Stuyvesant Town was built as affordable housing for WWII veterans. But in order to construct it, a huge group of low-income residents were evicted, and Moses was vocal about not letting black veterans into the complex. Though Stuy Town today no longer has a social cause attached to it, and has seen huge rent increases in recent years, we’re sure Moses would enjoy seeing the diversity of race, class, and age that makes it up now. Since Moses’ main goal in bulldozing the city to make way for various transportation projects was to create a more efficient way to move New Yorkers from point A to point B, it seems only fair that we give him the opportunity to commute to work on the Cross Bronx Expressway. Surely he’ll feel satisfied with his decision to devastate the South Bronx neighborhood of Tremont (along with many others) when he’s sitting in two hours of bumper-to-bumper traffic. While we’re on the subject of the Cross Bronx, how could we not give Moses the chance to take a ride on the Second Avenue Subway? 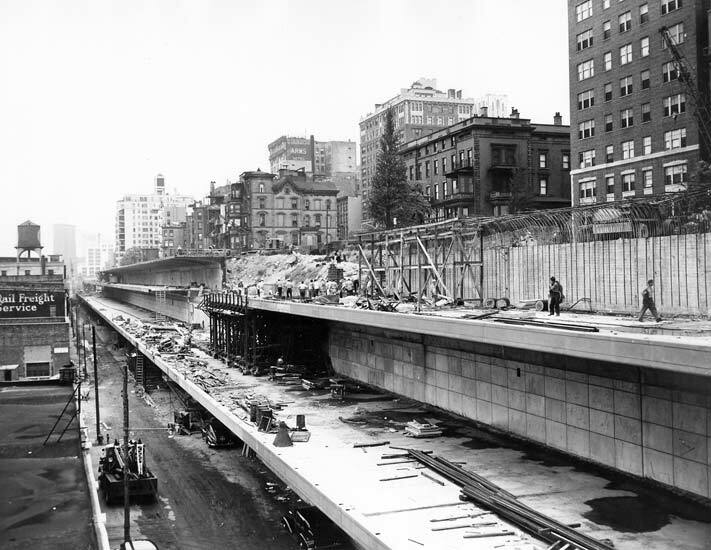 Oh, wait… it got shelved all the way back in 1942 when Moses, then the chairman of the Triborough Bridge and Tunnel Authority, blocked funds from going to the subway so they could support the Cross Bronx. Then in 1954, he did the same thing, this time to get the Major Deegan constructed. We couldn’t go all day without eating, so let’s treat the Power Broker to a nice al fresco lunch across from the Brooklyn Queens Expressway, another one of his vehicular infrastructure projects. To connect the two boroughs, Moses ripped through residential neighborhoods instead of taking a more unobstructed path along the East River. Therefore, the busy road is a fixture in many low-scale, otherwise quiet neighborhoods. But who doesn’t like some exhaust fumes with their burger and fries? How about putting Moses to work? We think painting some bike lanes would be the perfect task. In 2012, when the city first rolled out the Citi Bike system, then commissioner of transportation Janette Sadik-Khan was referred to by the Wall Street Journal as “the anti-Robert Moses, an angel sent down by St. Jane (Jacobs) herself to liberate pedestrians and put the automobile in its place.” To be fair, early in his career Moses did incorporate bike lanes in his Circumferential Parkway on Long Island, in Central and Prospect Parks, and along Brooklyn’s Ocean Parkway. But he also infamously refused to include a bike path across the Verrazano-Narrows Bridge for fear of suicides. Though Moses was so outspoken about his love for the automobile, he didn’t have a drivers license and instead had a hired limo drive him everywhere. We wonder how he’d like Uber? We’d definitely give him a tutorial in the car-service app, and we have a feeling he’d love it. And speaking of biking, let’s take him on a leisurely cruise through Governor’s Island, the land mass that he once wanted to turn into a giant anchorage to support his proposed Brooklyn Battery Bridge that would’ve taken drivers from Battery Park to Red Hook. We wonder if he’d like Hammock Grove, the various play fields, and the every-changing public art? Or if he’d still advocate for his preferred model of concrete playgrounds next to a highway. Though we took some jabs at Robert Moses here, it wouldn’t be fair to say he was all bad. In fact, he created more public parks than anyone in the country’s history, so with that, we’d end our tour at Prospect Park, as he halted plans for a highway through this major Brooklyn green space, calling it “one of the world’s craziest ideas.” Similarly, he blocked proposals to fill Gerritsen Creek and to dump trash into the Jamaica Bay and turn it into an industrial port. Another fun fact? The Journal notes that “long before Mayor Michael Bloomberg’s war against Slurpees, Moses banned candy, ice cream and soda from his city playgrounds. He made the children drink fresh milk instead.” In that case, maybe we’d actually end our tour with a kale salad in Park Slope.